Next, take the Kefir from the freezer and remove from the package. Add gauze in several layers. Spread the Kefir in the centre and wrap it so that it does not fall out. Tie the ends of the gauze so that the mixture can be hung. I leave Kefir in a suspended state for almost a day. During this time, the Kefir should completely melt, whey will separate and the curd mass should dry up a little. You can make pancakes or bread from this whey. It will look a little bit like cottage cheese. Now prepare the cheese. Put the Kefir into a bowl, and add pumpkin seeds. Cut the hot peppers into small cubes. Add the hot peppers, spicy herbs and sea salt to the bowl to taste. Form cheese balls of a small size, so that they fit into a tablespoon. Put them in a jar of vegetable oil. Fill the jar; pour in oil so that it covers all the cheese balls. 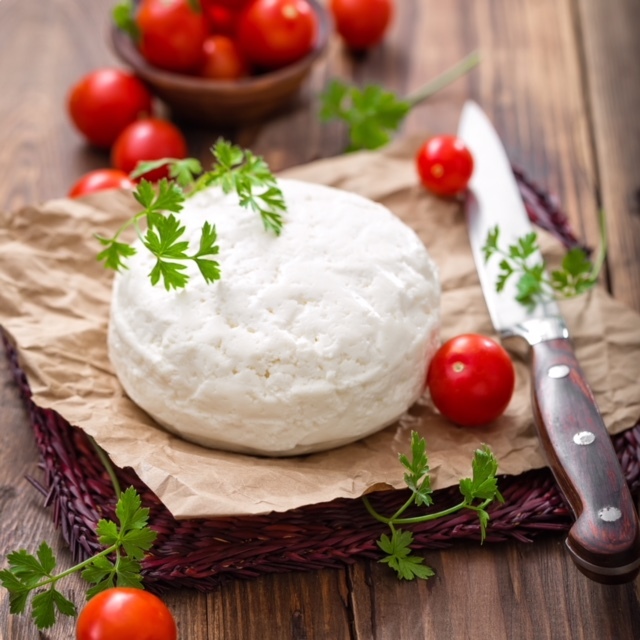 Store the Kefir cheese in the refrigerator for no more than seven days. Home-made cheese from Kefir goes well with fruits (I liked it with figs); cheese can be spread on to a sandwich or add to a salad.